Protesters outside gun store: What do we want? Sign the code. What do we want? Sign the code. 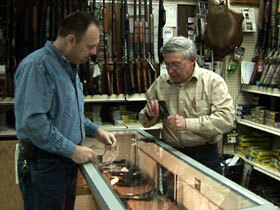 LUCKY SEVERSON, correspondent: This is a rare site these days—protesters outside a gun shop. It’s called Delia’s, and it’s in North Philadelphia. The organizers are religious leaders from many different faiths. There are also people of faith protesting the protesters, like Bill Grumbine. BILL GRUMBINE: Well, I am not here to demonstrate against the gun store. I’m here to show support for the gun store, and I always have a Bible with me. SEVERSON: Both sides say gun violence is a moral issue, and both rely on their religious views to support their opposing positions. Pastor David Tatgenhorst and Bishop Dwayne Royster say they’re not against guns or gun ownership but can no longer keep silent about gun violence. 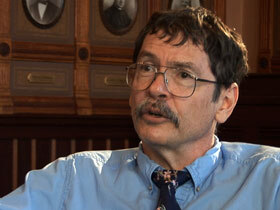 PASTOR DAVID TATGENHORST (St. Luke United Methodist Church, Bryn Mawr, Penn. ): Our coalition of pastors and rabbis and different religious leaders has just become so appalled that we’re so tired of burying young people and policemen. It’s just senseless what’s happening. BISHOP DWAYNE ROYSTER (Living Water United Church of Christ, North Philadelphia): The numbers of handgun-related crimes and murders in the city of Philadelphia is larger than that of most industrialized countries. SEVERSON: So these pastors who have preached against gun violence from the pulpit have joined an interfaith group called Heeding God’s Call in cities in Pennsylvania and Maryland, and they have taken their message to the streets. It’s aimed at gun store owners, and it asks them to sign a code of conduct designed to stop so-called “straw purchases.” That’s where a private citizen buys guns with the intent of reselling them on the street to someone who cannot legally purchase firearms. ROYSTER: Whenever they sell a gun through a straw purchase, there’s potentially a body at the end of that gun. SEVERSON: The same code of conduct was signed by Walmart, the largest seller of firearms in the country. ROYSTER: What we’re asking the gun shop owners to do is to do something moral and ethical in terms of their behavior, by being responsible not just for making money for themselves, but to be responsible for the community in which they find themselves, to make sure that guns go to only those who legally have a right to own them and to be able to use them. SEVERSON: Heeding God’s Call staged regular protests, sit-ins, and prayer vigils at this Philadelphia gun store called Colosimo’s. The interfaith ministers were responding to a Bureau of Alcohol, Tobacco and Firearms study showing that over 400 guns from Colosimo’s had been used in crimes. In fact, 12 interfaith ministers including Tatgenhorst were arrested for obstruction and conspiracy and spent a night in jail. Then they pleaded their case to the judge. TATGENHORST: The judge listened to this, and she acquitted us. Our argument was that we were trying to prevent a greater harm by breaking a smaller law. 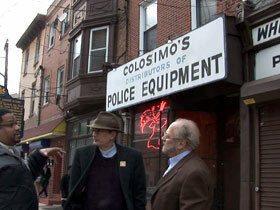 SEVERSON: A few months later, Colosimo’s lost its license to sell guns, a victory for Heeding God’s Call. PASTOR RUSS TENHOFF (Safe Harbor Ministry, Baltimore): I already have the Glock. I already have the 1911. SEVERSON: When the Baltimore chapter of Heeding God’s Call tried to close down Clyde’s Sports Shop after complaints of selling guns to straw purchasers, Pastor Russ Tenoff was there to defend the store. One of the owners, Bill Blamberg, says he won’t sign the code because it violates his customers’ privacy. But he knows some people get guns who shouldn’t. BILL BLAMBERG (Clyde’s Sports Shop): And I’ve had this happen a couple times. A guy comes in, you know he’s got a police record. He can’t buy one, right? He looks at this gun. It’s $549. He says, “I’ll give you a thousand dollars if I can take it today.” Now I’m not saying some dealers don’t do that, but Clyde’s don’t do that. SEVERSON: Pastor Tenhoff leads the Safe Harbor Ministry in a rough Baltimore neighborhood. He opposes Heeding God’s Call’s mission. TENHOFF: If we could eliminate all guns I would be all for that. But the fact of the matter is until Jesus puts his feet on the Mount of Olives and then peace reigns over the whole planet, we’re going to have to protect ourselves and even protect the people around us, and if the criminals have guns, then we need to have them. SEVERSON: One thing is certain: there is no shortage of guns in the US—as many as 300 million at the latest count. In some circles, owning a gun appears to be the patriotic thing to do. For those who predicted a rash of gun control laws after the Tucson shooting—barely a whisper. A few weeks after the shooting, the governor of Utah signed a bill proclaiming the first official state gun, and the University of Texas is about to become the second major school after the University of Utah to allow students to carry concealed weapons on campus. Clyde Wilcox is a professor of government at Georgetown University and author of several books on subjects like gun control and the Christian right. PROFESSOR CLYDE WILCOX (Georgetown University): The interesting thing is we’ve come to the point where the debate is over whether you can carry a weapon in a bar, in a church, in a gymnasium, which were the places in the past where we thought maybe you don’t want to have a gun because fights can break out or people can become inflamed. So it’s really on the edge that we’re having this whole discussion now. ROYSTER: Jesus ministered to the most marginalized, and he didn’t do it with a gun. He didn’t do it with violence. He did it with love. TENHOFF: I have been a man who has turned the other cheek. You’re talking to a man who has been jumped by gangs and beat. You’re talking to a man who’s been in several knife fights. You’re talking to a man who has been shot at, and you’re talking to a man who has grown up in the drug-infested violence of this area, and I have turned the other cheek and I have taken beatings. But I’m not going to let my little boy suffer violence. I’m going to act. I’m not going to let my wife be raped. I’m going to act. SEVERSON: A number of mainline churches have had longstanding positions in favor of some kind of gun control, but for the most part churches have been noticeably quiet. In fact, an increasing number of pastors are now speaking out in support of the Second Amendment, saying it was inspired by God. WILCOX: I talk to a fair number of pastors who kind of take a fundamentalist reading of the Second Amendment the way they take a fundamentalist reading of the Bible. SEVERSON: Pastor Tatgenhorst says he understands why more religious leaders haven’t been more outspoken about gun control. TATGENHORST: It happens, and I know that I have had colleagues who are scared to talk about guns. They’re afraid that people in the pews will object to that. WILCOX: Well, the mainline congregations are declining. 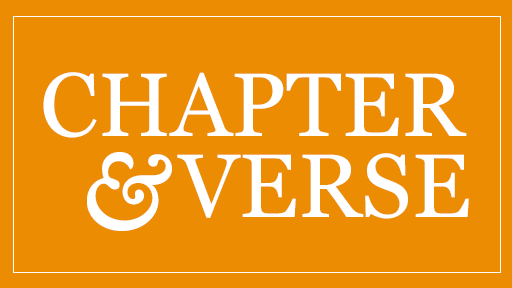 Their populations are aging, and so the question is what issues do you want to take on that might possibly divide your congregation? Would you take a risk of losing 10 percent of your members in a declining church by taking the prophetic stand about gun control at a time when gun control laws are probably not going to be stiffened? SEVERSON: Rick Hellberg is a member of Pastor Tatgenhorst’s church. 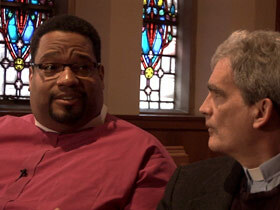 He supports his pastor’s position against gun violence but, unlike the pastor, he sees the Second Amendment as sacred. His rationale is quite common among opponents of government-sponsored gun control. RICK HELLBERG: If part of my right to hold a gun is to protect myself from the potential tyranny of a government or a standing army—if that’s the case, then I should probably be able to be armed almost as well as those standing armies are. The NRA [National Rifle Association] takes the position that if we give an inch Washington will take a mile. SEVERSON: But this isn’t coming from Washington. It’s coming from faith leaders who are trying to do what they say Washington and state governments haven’t done—curb gun violence. ROYSTER: We’re not trying to prevent their business. We’re not trying to prevent them from selling guns. We’re not trying to prevent people who have a legal right to possess guns from possessing them. We just want to make sure they don’t get into the hands of the wrong people. SEVERSON: …who think that something needs to be done to stop the killing. 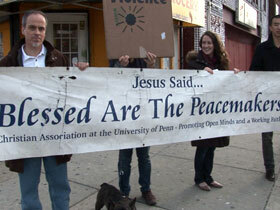 For Religion & Ethics NewsWeekly I’m Lucky Severson in Philadelphia.